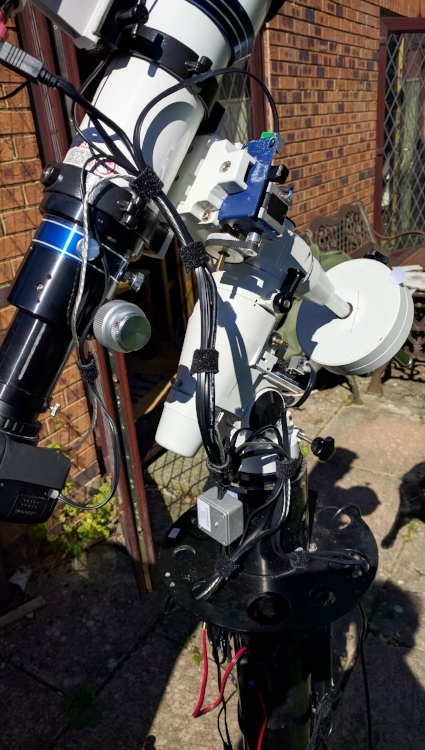 After I slowly started to expand and automate more and more components on my telescope it became clear that cable management was become a bit of nightmare. The photo on the left still shows it all fairly organised but this was with out my other project, the motorised filterwheel and motorised focuser. On top of that I am also working on a cooler box for my DSLR camera. 2 cables for the RA & DEC motors that come from my EQAstro box. Power + USB for my DSLR Camera. USB for my finder scope. Power + USB for my motorised filterwheel and focuser. Power for the dew heaters of my main scope. Power for my dew heater ofmy guide/finder scope. Adding this all up come to 4 12v power leads, 3 USB cables & 2 cable for RA & DEC control. That comes to 9 cables in total that I need to bring up through the mount to the scope. All these cables need to move freely to ensure the mount can move in all the directions required. This made me decide to see what I can do to reduce the number of cables. At the end I came up with a design which would reduce to number of cables to two. One 12v power cable and one USB3 cable. It will be slim box that will sit on top of my scope between my main scope and finder/guide scope. To box will be fixed to the 2 scope brackets which hold my ED80 in place. On top of the box I the finder/guide scope will be directly mounted. This meant that the box has to be ridged & strong enough for it to hold the finder/guide scope without causing any flex when the mount is moving. On top of all of this I want to try to do this all for a low budget as of the shelve solutions are available but these cost £150+. Two Dew Heater require 1 amp each. AstroEQ box requires 3 amp. USB connections (I choose a 4 port USB3 hub) need 1 amp. Arduino Focuser and Filterwheel need 2 amp. DSLR camera need 1 amp. For the dew heaters I need 1 mono RCA Jack as I have dual dew heater control unit i purchased from Dew Control and replaced the Sigarette socket with a Mono RCA plug. My DSLR camera 7.4v DC Jack socket. I decided to move my AstroEQ up to the scope instead of it sitting on my pillar. So for this I will need a 12v DC Jack socket. I also want to have each set of items (e.g. Dew Controller, USB connections, AstroEQ socket) protected by a fuse. Last, I want to be able to switch each individual set of items via an electrical relay that I can remote operate from my Computer. To create this box my equipment list will look as follow. Sturdy plastic box. I choose a the Hammond 1599KSGY. 4 port USB3 hub. I choose the aLLeri Ultra Slim USB3 4 Port Hub. The USB3 requires 5v so I needed a 12v to 5v converter. For this I choose this converter. 1 USB A to B lead adapter for connecting the Arduino board to the USB hub. I got this USB cable converter. 1 LED switch to power on/off the box, I got this one from ebay. 4 way relay switch board from switching on/off the AstroEQ, Dew Heaters, Canon DSLR, DSLR Cooler Box. I got this one from ebay. The ability to split a 12v input to the different items with the items being fuse protected. I spoke with the manufacturer of this item to ensure that it can take 12v 10 amp as input and use circuits (fuses) between 1 and 3 amp. They confirmed it will work. This is the 12v fused splitter. Finally I needed the power supply. The power supply will be sitting outside of the box and got one of these. Last I needed some connectors and wire that can handle 10 amp. These I got from our favorite local electronics DIY shop, Maplins. Building the box and putting it all together was at the end not to difficult just as long as you measure twice and cut once. I started with removing all the screw mounts in the box. Then did laid out the major components in the box and cutting the space where the USB hub will sit. The USB hub and Arduino will be raised from the bottom of the box. I also soldered the wires to the connectors for Filterwheel & Focuser motors. You can see the result on the left. Here you see how I have lifter the USB hub and Arduino from the floor. In the final version I used these spacers from ebay. These sockets are 16mm in diameter each. I also cut the hole for the main switch and screwed in the 4 way relay board. You see I used metal screws in the photo right but the final version had plastic screws. Now I started the final layout and put it all in place. What you do not see on the photo on the right is the 12v to 5v converter. This has been placed under the allreli USB3 hub. Under the USB connector between the Arduino and USB Hub you see a Voltage regulator. This is to convert the 12v to 7.4v for my Canon DSLR D1000. I made this using this diagram. Here a view from the side where you see to sockets (from left to right Filterwheel & Focuser, Canon 7.4V, AstroEQ, Dew Heater RCA Socket and last the main 12v input socket. Above the 12v socket you see a small cutout. This is for the USB3 cable that connects to the USB hub. The full code for the Arduino UNO and associated ASCOM C# drivers can be found in my GIT hub repository. Switch - This is to control the 4 way relay. My drivers use the LocalServer implementation to enable me to control all drivers through a single COM port. Final setup all put together and switched on. You can see how the USB3 cable is guided out of the box. Guidescope mounted on top of the box. Powerbox and Guidescope mounted on the main scope with all cabling in place. Now only 2 cables come down the mount (one 12 power cable and one USB3 cable.